Exponential co-founders Todd Wilson and Dave Ferguson introduce and explore the Becoming Five framework in this free eBook. From the folks at Discipleship.org, Exponential co-founders Todd Wilson and Dave Ferguson introduce and explore the Becoming Five framework. Focusing on helping churches identify where they are on the multiplication scale (Levels 1 – 5) and what’s needed to become a Level 5 multiplying church, Todd and Dave champion multiplication and equip future church multipliers to move beyond the prevailing addition-growth scorecards. The book is positioned as a “field guide” to help leaders compare and contrast the differences between subtraction, addition and multiplication cultures. Becoming Five. 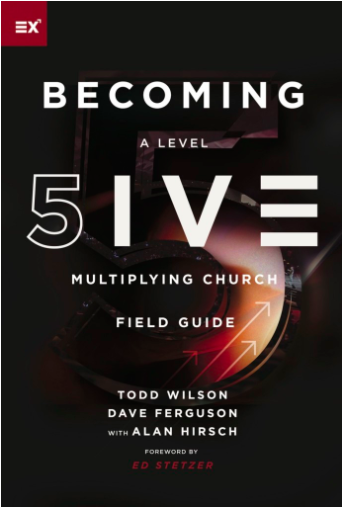 Becoming a Level Five Multiplying Church continues a conversation started in the 2014 Exponential book Spark: Igniting a Culture of Multiplication, drilling down into more detail focusing on how we can each play our part in moving the needle on church multiplication. While Spark introduced these three core elements of culture, in this book Todd and Dave press more deeply into how we live them out. In this expanded version, Alan Hirsch also provides an additional chapter & comments throughout the book. Focusing on the specifics of helping churches identify where they are on the multiplication scale (Levels 1 – 5) and what’s needed to become a Level 5 multiplying church, Todd and Dave champion multiplication and equip future church multipliers to move beyond the prevailing addition-growth scorecards. The bottom line, the authors say, is that we need to rethink the operating system that’s producing growth but not producing multiplication—and aim for more healthy Kingdom growth that’s focused on multiplication. Recommended On ChurchPlants: Free Sunday School Lesson Package: "The Generosity Adventure"